The launch of the all-new Proxes CF2S brings an exciting new tyre that promises the highest levels of safety, grip and wet-weather performance in an attractive case design that comes in many sizes and fitments. The New Proxes CF2S offers exceptional all-round ability and excellent value. Ideal for medium and high-powered cars, the CF2S utilises the very latest materials and production methods, drawing heavily from our Ultra-High Performance and Motorsport ranges, to create a tyre that offers exceptionally high levels of safety, durability, value and comfort. 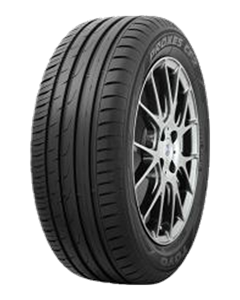 Right choice of tyre for drivers who are looking for a high performing and safe tyre for medium and high powered cars. Created to take advantage of the latest materials, structures and tread pattern design in order to guarantee a high level of safety, durability, savings, and comfort. Benefits from an improved tyre construction and a new full-silica compound which both provide better wet performance, lower fuel consumption and a longer tyre life. Features a super active polymer compound which gives for improved mileage and rolling resistance performance. Designed with wider main grooves that provide excellent wet braking, water clearance and enhanced aquaplaning resistance. Optimised pattern stiffness on the tyre gives for low rolling resistance, increased mileage and improved wet and dry braking. Also features a shoulder rib block which reduces overall noise made by the tyre.